My last glimpse of reality was three days prior, July 27, 1999, at 3 a.m. I had been soaking in my hot tub on the patio of my condo, trying to soothe my jumpy nerves. Now I sat reflecting on that lovely moment of 3 a.m. bliss. It was summer, the night was a cozy dark blanket between me and the rest of the world. My kids were asleep, our bags were packed and stuffed in the car. We were ready for our 5 a.m. exodus from reality. My children thought we were going to see the pyramids. I was soaking in my hot tub as a kind of ritual cleansing. I wanted to wash my old life off and start my new life fresh and clean. My whole family thought I was crazy. One of my brothers had tried had to dissuade me, even threatening to tear up my travel documents to “protect” me and my kids. My mom was so upset that at the last minute she refused to let me park my car at her house and would not give us a ride to Newark International Airport as we had earlier planned. I was already a nervous wreck, and this new thought of paying for half a month of parking at an airport added another heavy burden in my baggage. I leaned back in the hot water, eyes closed, and played “on the one hand” and “on the other hand” one more time. The result was always the same, always exciting to the point of shivering, even in a bubbling hot tub. Maybe I was crazy, but I knew I was going to do it. 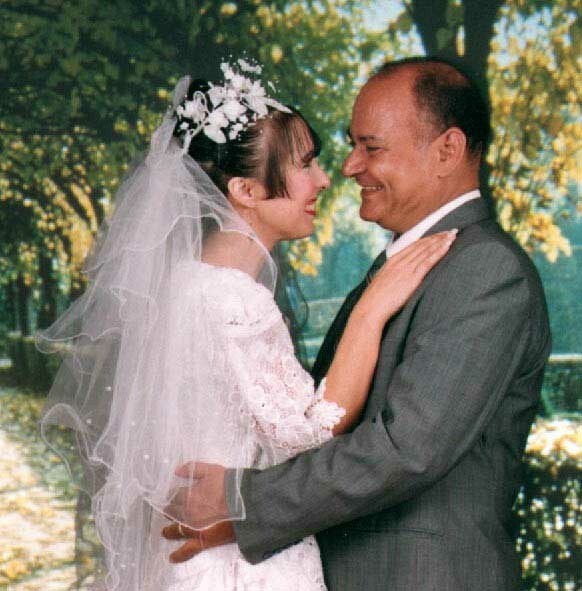 I was going to Egypt to marry a man I met on the internet. I had never laid eyes on him, and it was all arranged. Within 24 hours of our first meeting, I would be his wife. Signed, sealed and delivered. I was flushing the past 20 years of awful marriage to a mean drunk, a miserable divorce and a year of therapy while conquering a condo. I was ready for something exciting. Damn the torpedos – Full Speed Ahead! On the one hand, some people get married after a night on the town. I, on the other hand, had lots of photos and phone conversations, and a 3-inch binder stuffed with email printouts. What more does a woman need after 50 days on the internet? Now, here I was, sitting in a dark room somewhere in the middle of the Nile Delta. The room was long and narrow, with only the light of day illuminating the entrance. An old wooden bench supported me as I sat, peering into the dark as my two young children explored the depths of the room. Peeking through the open door at the far end, they cried delightedly upon discovering another room with chickens running around inside. I went to look. Light streamed in haphazardly from a thick grapevine arbor above. The floor was dirt, the walls were mud brick. My children had huge smiles on their faces, chasing the multi-colored chickens between little woven wooden crates and other miscellaneous debris. They laughed and the chickens cackled. I rolled my eyes, grinned, and returned to my perch in the cool darkened room. A man suddenly entered from outside and I pretended not to notice. I had glanced that way when the light had been blocked but turned away nonchalantly. Reviewing the photo in my mind, I thought he looked similar to my new husband, but I knew right away it wasn’t him. Happily, my husband prefers western style business suits. In my new apartment in the city, I found his closet full of wonderful suits, shirts, and ties. This man, however, was wearing a long, white nightgown. My kids were just past the nursery rhyme stage and “Wee Willy Winkie” ran through my head. I bit my lip to keep from laughing out loud. His back to me the whole time, the man silently struck a match, lit a fire on a strange small box-shaped metal grill, and adjusted a valve on a small torpedo-shaped metal cylinder. The flame was extremely high and hissing loudly. I was peeking from the corner of my eye and growing alarmed. From a dusty small cabinet on the wall, he took down a small orange box, a dusty glass cup and an old, dented brass vase with a long metal handle. Still without a word, he stepped outside and returned momentarily with the cup sparkling clean and the small brass vase full of water. I realized then that the vase was, in fact, a kind of teapot. He carefully measured black powder from the orange box into the brass teapot. It hissed and sizzled when he immersed it into the flames, setting it on the grill. Then he left the room without a word or a glance. My husband had gone off earlier to talk with construction workers. He was preparing to remodel the 2nd floor, above me, to be our new home in the country. When he had left me and the kids in this old, darkened, narrow room I had felt sure no one had lived there for ages. It occurred to me now that I must be wrong. What were the chickens doing back there, after all? And the tea in the cabinet? I peered again into the dark, trying to understand my surroundings, ignoring the man when I heard him return again. The scent of freshly picked mint filled the room, and I heard the hissing stop. The tinkling of a spoon in the glass cup caught my ear and I turned to see the man stirring sugar into the cup. He had poured hot tea over the mint and it swirled in the wake of the spoon. He handed me the cup without looking me in the eye, and silently left the room. I sat alone again in the dark, cupping my tea while sitting on an old wooden bench. My back against an ancient dusty wall. Pink sweater, white skirt, children playing with chickens. I sipped my tea and wondered how much further from recognizable reality this journey would take me. 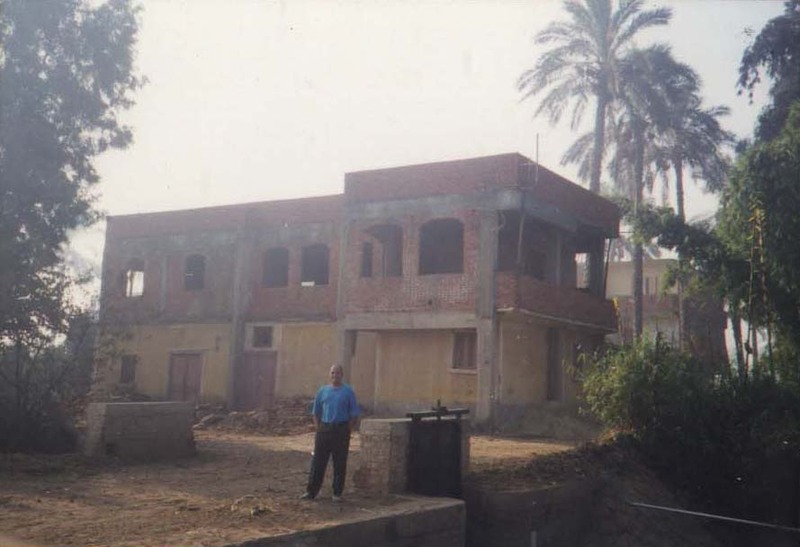 My future oasis in Egypt – our 2nd floor under construction. ← #Voices4Arctic – Please Share Widely! Thanks, Marina! I was wondering if those little teapots found their way around to Greece – Turkish coffee is probably how they made it to Egypt, too. Thanks for visiting! Ups and downs, but life’s pretty good. Look forward to catching up too! Barak Allah fiki, Nour, Thanks for visiting! There are so many riddles and things to explore in life, I wish you best of luck and happy and healthy life for you and your family.